Some Flickr users noticed the company’s “About” page was upside-down yesterday. Yes, literally upside-down. And yes, we checked, it wasn’t just us. As it turns out, yes, Flickr’s upside-downness was on purpose. Yahoo confirmed to us today that the “mistake” was actually an easter egg meant to celebrate Australia Day (Jan. 26). “We changed our About page for Australia day (hence the upside-down) and replaced the team photos with all things Australia – for example photos of kangaroos,” a company spokesperson noted. The message was simple: “You’re reading. 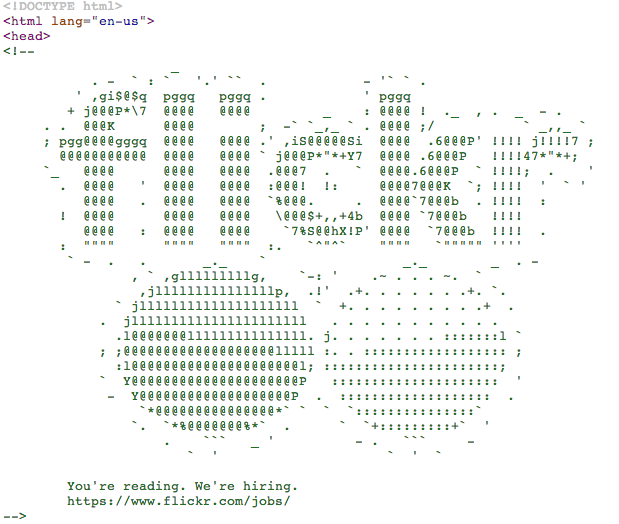 We’re hiring,” followed by a link to the Flickr jobs page. We asked Yahoo how well the stunt performed in terms of referrals, but the company declined to say. According to Twitter, only a handful of users even noticed the change, it seems – which may speak more broadly to Flickr’s current “coolness” factor than the company may have liked to share.